Is there any information available regarding how much remittances going to a particular district/city in Pakistan? Say top 10 remittances receiving districts/cities in Pakistan. Qureshi: "s there any information available regarding how much remittances going to a particular district/city in Pakistan? Say top 10 remittances receiving districts/cities in Pakistan." "Migration and remittances have provided a source of income for households in Khyber Pakhtunkhwa (KP) and other provinces in Pakistan. A recent Asian Development Bank study found that foreign remittances constituted 9.4 percent of household income in KP, compared to 5.1% for Punjab, 1.5% for Baluchistan, and 0.7% for Sindh"
So Pakistan has twice the remittances per GDP.How come? Anon: "So Pakistan has twice the remittances per GDP.How come?" It's because India incorrectly reports the wages earned by India's temp tech workers abroad as IT exports, not as remittances. There are conservatively 600,000 Indian H1B workers in the US each being paid conservatively $80,000 a year. This adds up to $48 billion from US alone. Part of this amount should be counted as part of remittances from overseas workers, not as IT exports for the year. "Prime Minister Nawaz Sharif's family, are moving and hiding in offshore tax havens the hard-earned dollars sent home by overseas Pakistanis to keep Pakistan's economy afloat." How does that work, Sir? Ali H: "How does that work, Sir?" There are 4 sources of US dollars in Pakistan: Exports, Foreign Aid, FDI and Remittance from Pakistani diaspora. 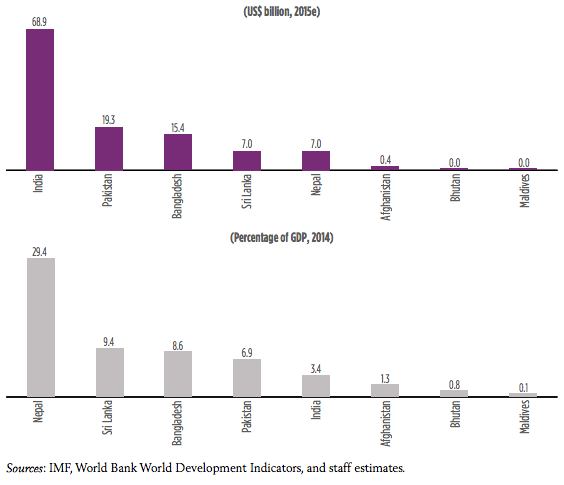 Of these, remittances represent the largest or the second largest share. These are the dollars in Pakistan that are moved and hidden offshore by Pakistan's corrupt elite. Per The Economist and IMF India is set to grow by 7.6% and Pakistan by 4.8% in2016-17. You mention remittances showing high growth for Pakistan and software service exports from India inflated. I am puzzled or there is a bubble about to burst? Shah: "Why Can't We Lobby US Government for H1B Visas and Also Lobby The Silicon Valley Giants To Come And Offer Placements To Pakistani Students The Same Way"
There's a reason why no nation other than India does this: Body shop business run by Tata and Infosys and other Indian "IT" companies is a highly exploitative form of human trafficking that is akin to indentured servitude. It takes a great human toll on young educated Indian professionals who serve as code coolies. The preferred path is to keep your human capital at home and use them to develop real software products and services that can be used at home and also exported. Well just one problem with this theory and it is at a fundamental level. Over invoicing can lead to loss of tax revenue which got nothing to do with remittances ! Plus, the point of over invoicing is somehow to keep the earning/money hidden. Why would he then remit the money and document the transaction ? Ali H: "Over invoicing can lead to loss of tax revenue which got nothing to do with remittances ! " >>>"It takes a great human toll on young educated Indian professionals who serve as code coolies." People take pride, no one is shackled to be a "code coolie". PASHA and other agencies have tried in Pakistan and have barely been able to make a dent. So don't trivialize or ridicule it. It is one of the most important factors that has been helping India grow. "Code Coolie" economy has helped a whole bunch of other supporting Industries and innovation to thrive. Why dont you take your own advice and send your own human capital (yourself) back to Pakiland and develop "real software products and services" that can be used at home and exported. And what about the millions of Pakis who work elsewhere and send back the USD 19 billion remittance that you proudly speak about. Why not ship them back so that they can develop (software and other) products and services that can be used at home and also exported. Majumdar: "And what about the millions of Pakis who work elsewhere and send back the USD 19 billion remittance that you proudly speak about. " There is no organized body shop business in Pakistan like there is in India in the form of Infosys and TCS. You know nothing about the horror stories all too common for Indians who are brought to the US shores under H1B that ties their fate to them like that of slave to his or her master. The closest thing to it are the brick kiln slaves in India. Here's a Janus image for you. On the one side, half a dozen H-1B workers bunkered in a choked 'guesthouse' in America, anxious to be summoned by their labour broker to a job they know will pay discriminatory wages and mean long hours. When they do get the job, the broker often pockets a cut and can even sue if the employee quits or switches jobs. Cut to India where hundreds of young men line up outside the offices of the very same labour brokers, ready to pay out large sums for their American dream. The nightmarish story of the 'indentured' Indian tech worker in America has found its most recent rendering in a graphic novel published by The Center for Investigative Reporting (CIR), a non-profit American organization. A Pulitzer Prize finalist in 2012 and 2013, CIR may just be in the running again for its work on the mercenary practices of the tech 'in-sourcing' industry, which thrives on the inflow of highly-skilled Indian tech workers on H-1B visas. CIR's graphic novel has been scripted and sketched by Silicon Valley reporter Matt Smith, who along with fellow journalist Gollan, spells out the tech staffing firms' damning five-point modus operandi - 1. Companies lure Indian workers to the US with phantom jobs. 2. Workers are often unpaid (brokers withhold salaries). 3. Brokers demand cash for visas. 4. Workers often feel pressure to "spice up," or falsify, their resumes (brokers often suggest they do this in order to get hired). 5. Bonding and penalties are heaped on workers who quit. They also write about the culpability of US government departments that have looked past H-1B violations. Smith and his colleagues, Jennifer Gollan and Adithya Sambamurthy, spent a large part of their year-long investigation tracking down workers who would actually talk to them. "The wall of silence from Indian IT workers can only be compared with attempting to investigate an organization under a strict Omerta," says Smith on email. "Early on I was writing and calling people I found through LinkedIn and Nexis, and databases such as Benchfolks, chat rooms such as MyVisajobs and Goolti.com, and a list of industry contacts used by labour brokers. Ultimately, it turned out that the most effective way to find workers willing to talk was to go physically to local courthouses with a digital scanner in hand, seeking to find lawsuits involving suspect companies." Few victims are willing to challenge staffing companies or employers in court because judgments against Indian workers who have 'violated' their contracts by switching jobs or quitting before time can incur penalties in excess of $50,000, CIR discovered. Gobi Muthuperiasamy took that risk. The software engineer from Madurai spent three years in court when his labour broker sued him for switching jobs. Although Muthuperiasamy won the case, and didn't have to pay his broker a penny, he was still poorer by $25,000 in legal costs. Are you saying that it wud be better for India/Pakiland to have unorganised body shops? And what about the millions of unskilled Indians/Pakis who work in ME, under far worse conditions. These are the guys who bring in the USD 69 billion/19 billion that you refer to. Surely you are aware of that. And face the reality, sir. If Pakiland had a Infy/TCS with billions of dollars in revenues and m-cap, you wud be proudly writing about them, not calling them body shopping firms. Majumdar: "And what about the millions of unskilled Indians/Pakis who work in ME, under far worse conditions." Vast majority of those who toil in the Middle East come from a different stratum of society; they are not the best educated and the most skilled; they are not the cream of the crop. They have fewer choices. "You know nothing about the horror stories all too common for Indians who are brought to the US shores under H1B that ties their fate to them like that of slave to his or her master. " And you know nothing about 100s of 1000s employees of IBM/Oracle/MS/Intel in India and who bring $ to India. Body shopping companies are not a major part of India IT industries. India has moved far up in value addition. You don't seem to be aware of that, or may be you are pretending so that you can feel better. Pakistan could not do anything in IT , not because they don't want to, but because they are not capable. Surely Pakistanis are not stupid to focus only on low value addition of underwears and towels, where they are increasingly getting squeezed out. BTW do you know the horror stories of the working conditions in Chinese factories like Foxconn. they have protective nets to stop suicides when workers jump from floors. Actually I should not have said "Pakistanis are not capable". they can do it too, provided the country sets its priorities right. In the remote Pakistan village of Hakimwala, farmers battle a deadly pest that is ruining their cotton crops. Many find it difficult to afford the pesticide and face mounting debts. The elders of the village encourage the young men to travel abroad to earn better pay and help lift the village out of poverty. Twenty-nine-year-old Sharif has lived in Hakimwala all his life. He is an only son and drives the only car in the village. He is responsible for driving the sick to the city hospital three hours away. But with the infestation of his cotton crops and rising debts, Sharif decides it is time to seek his fortune elsewhere. Sharif decides to go to Dubai despite warnings from his friends. The villagers sell the car and his family sells their hard-earned lands to cover his expenses. For the first time in his life, Sharif leaves his village, flies in an airplane and experiences a foreign land. In spite of mounting debts, Sharif is about to learn that there is more to life than money. Or is there?